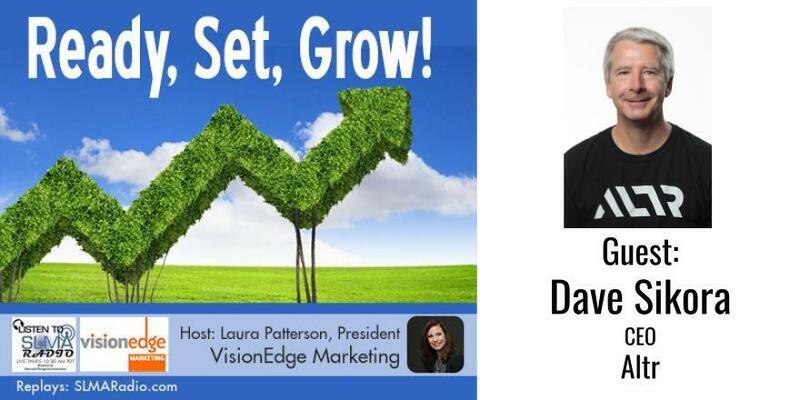 Host, Laura Patterson interviews Dave Sikora, CEO, Altr for her monthly program: Ready, Set, Grow! LIVE Thursday, 7/19, 10:30am Pacific. Ready, Set, Grow! is to provide a venue for CXOs to share their insights on what it takes to successfully achieve organic growth, lessons learned, the role they believe Marketing needs to play in growth and how they measure Marketing’s contribution beyond this “quarters” revenue. A software industry veteran, Dave has previously served as CEO of 2 public and 5 private, venture capital backed software companies and has held board director positions with 4 public companies. He executed the first Internet Software IPO in the State of Texas in 1995 and collectively his companies have raised over $100M in venture capital and have experienced exits and value creation events of almost $1B. Dave was most recently the CEO of Stratfor, a global intelligence and research firm with industry-leading products focused on emerging global physical and cybersecurity threats. Dave is an alumnus of the University of Houston and Harvard Business School. Sales is a profession with a steep learning curve, and a short timeline to produce results. If you’re a new sales development rep (SDR), what can you do to succeed, and what mistakes should you avoid? Host, Darryl Praill interviews Lori Richardson on this topic. Lori Richardson is the founder of sales consultancy Score More Sales, where she helps company leaders fix sales team issues to grow more revenues. She is the voice for “more women in sales” and is the President of Women Sales Pros, chartered to get more women into B2B sales and sales leadership roles in companies with male majority sales teams. In Lori’s technology and financial services sales career she worked for 23 different sales managers and she has helped onboard over 1,000 SDRs, BDRs, and AEs in a 3 year period. Her new book, “She Sells, She Leads” will be available in September. Our new monthly show, INSIDE Inside Sales hosted by Darryl Praill, Chief Marketing Officer at VanillaSoft welcomes guest, Don Wynns. VP of OEM and Partnershps at HG Data. They are talking about Data: Past, Present and Future. Don is a business development professional with proven track record of creating, and growing revenue streams through the indirect channel. Don’s executive presence, vision, and commitment to win-win partner relationships is well known within the B2B data industry. When not working west coast hours from his home in Boston, Don spends time with his wife and two teenage children and his golden retriever, who accompanies Don to the office every day. The host is Jim Obermayer. 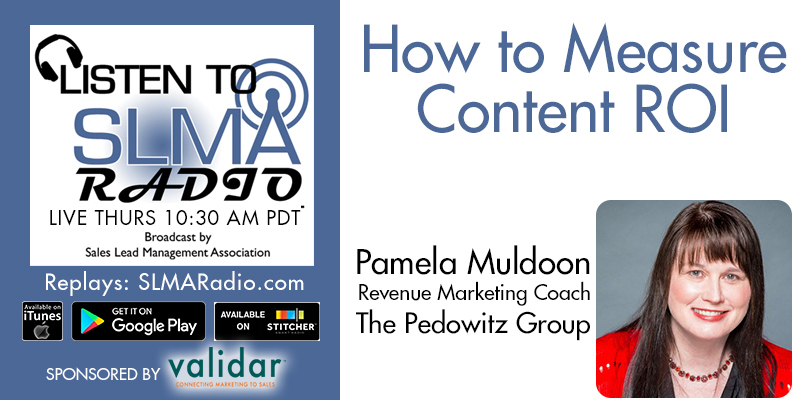 Pamela Muldoon is a Revenue Marketing Coach with The Pedowitz with over two decades of traditional and digital marketing experience. She specializes in campaign and content strategy with a passion for helping clients develop a content marketing culture across the organization. Her marketing career started over thirty years ago when she transitioned from on-air personality to Copy Director for a radio station in Wisconsin. Since then, she has taken on multiple marketing roles in her career, having worked with companies like ING, Prudential and Content Marketing Institute. Pamela was named one of the Top 50 Women in Content Marketing in 2017 and in 2018 one of the 20 Women to Watch from the Sales Lead Management Association. Pamela is also a professional voice over talent and podcaster. When not online working on digital marketing strategies, she can be found unwinding at a Las Vegas poker table or hanging out with her two dogs, Maddi and Copper. The Pedowitz Group (TPG) is a Revenue Marketing™ consulting firm headquartered near Atlanta, Ga. We believe that Marketing is the driver of customer engagement that fuels the revenue engine. Many of today’s successful CMOs are operationalizing business accountability, digital transformation and the customer experience through marketing operations. As your partner, TPG helps you plan, build and optimize your revenue engine by delivering services in MarTech, demand generation and marketing operations. TPG has worked with over 1,300 clients to enable marketing and sales. Our expertise spans the six major categories of MarTech, including marketing automation, CRM and content platforms. We specialize in helping mid-market and enterprise organizations in financial services, manufacturing, software, technology and business services. The Pedowitz Group customers have won over 50 national awards for their Revenue Marketing excellence. To discover how we can help your organization become successful Revenue Marketers™, visit http://www.pedowitzgroup.com, or call us at 855-REV-MKTG or visit Revenue Marketer Blog. 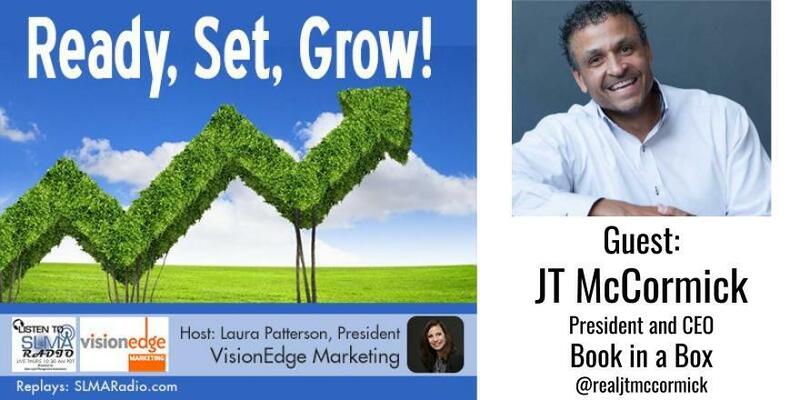 Host, Laura Patterson interviews JT McCormick, CEO/President of Book in a Box for her new monthly program: Ready, Set, Grow! LIVE Thursday, 6/21. Ready, Set, Grow! is to provide a venue for CXOs to share their insights on what it takes to successfully achieve organic growth, lessons learned, the role they believe Marketing needs to play in growth and how they measure Marketing’s contribution beyond this “quarters” revenue. category as the #2 best company to work for in Austin. book tells the story of how he worked his way out of poverty, starting his career cleaning toilets and eventually becoming the President of multiple companies. Over the past five years, JT has mentored at-risk youth in the juvenile justice system as well as youth within low economic communities. He has also coordinated Backpack Drives for numerous elementary schools in low economic communities, providing over 3,000 backpacks filled with school supplies for students. 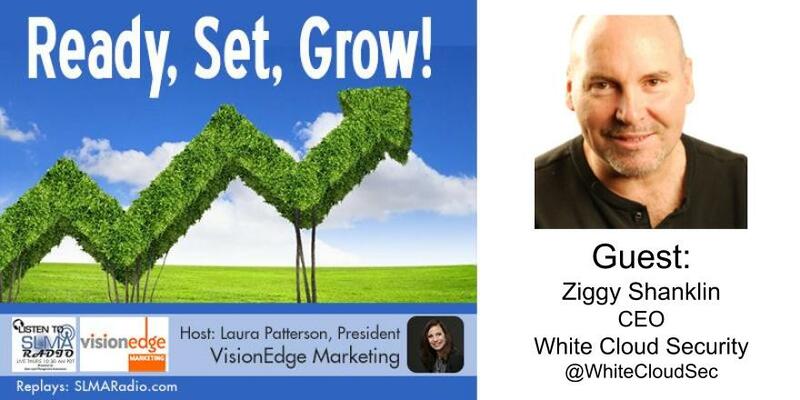 Host, Laura Patterson interviews Ziggy Shanklin, CEO and Founder of White Cloud Security, Inc. for her new monthly program: Ready, Set, Grow! Ready, Set, Grow! is to provide a venue for CXOs to share their insights on what it takes to successfully achieve organic growth, lessons learned, the role they believe Marketing needs to play in growth and how they measure Marketing’s contribution beyond this “quarters” revenue. Steven “Ziggy” Shanklin, CEO and Founder of White Cloud Security, Inc., is a leader in groundbreaking development for the cyber-security industry. Ziggy was the Director of Software Development for two cyber-security startups acquired by Cisco Systems, Wheelgroup Corp (1998) and Psionic Software (2002). Prior to starting White Cloud Security, where he invented their breakthrough “App Trust-Listing” technology, he was the VP of Engineering at Coretrace, Inc, an application whitelisting company acquired by Lumension Security (2012). White Cloud Security provides a Trust-Listing cyber-security service that blocks all untrusted Programs and Scripts from running on users’ computer systems. In 2017, the WannaCry and Petya Ransonware attacks infected hundreds of thousands of computers worldwide. Hacking has became a big business for criminal organization and is now more profitable than the illegal global drug trade in marijuana, cocaine and heroin combined. The cost of Ransomware for 2016, grew from $209 Million in Q1 2016 to $1B, and was expected to reach $5B in 2017. Application Whitelisting/App Control technology is the number one type of breach prevention solution recommended by Dept. of Homeland Security’s US-CERT, the NSA, the FBI, Australia’s ASD, Canada, AIG, SANS, ISA, and NACD; but is nearly impossible to deploy and manage on a large scale. App Trust-Listing, the Next Generation of Application Whitelisting/App Control, uses Secure Crowd-Sourcing and Trust-Inheritance to simplify the deployment and management of which Apps are Trusted to run in your network. It’s a simple and effective solution to the rapidly expanding array of today’s ransomware and malware threats. CEO’s: Will You Win or Lose the Revenue Acceleration War? 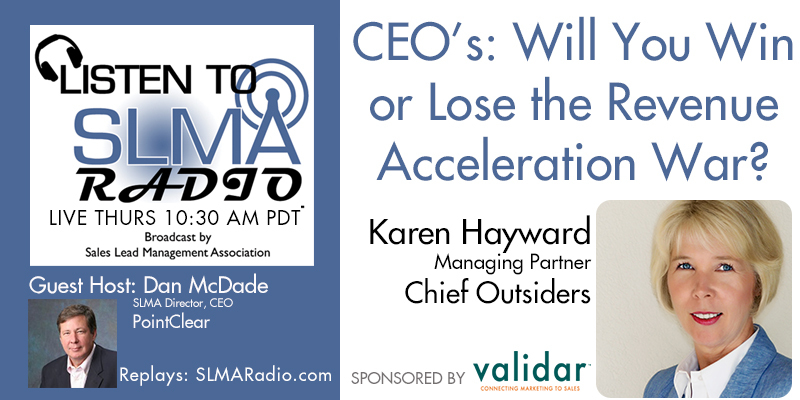 SLMA guest host and board member Dan McDade (CEO of PointClear) interviews Karen Hayward a managing partner of Chief Outsiders on the subject of what separates winners and losers in the revenue wars. The interview covers three tactical areas that winners use, and loses fail to implement. Very interesting. Karen Hayward is a Managing Partner with Chief Outsiders, responsible for West Coast Operations. She is a results-oriented marketing, sales and operations executive with a proven track record for building and executing strategic programs that accelerate revenue. Karen joined Chief Outsiders from EarthLink where she completed the integration of their acquisition of CenterBeam. At CenterBeam, she spent a decade as CMO. Karen’s early career set the stage for her later successes; while at Xerox Canada Ltd., she held a variety of corporate marketing, and sales leadership positions, ultimately developing and leading the company’s first industry focused go-to-market effort as VP and General Manager for the Financial Services sector. From 1995 to 1998 she held VP of Marketing, and Director of Product Marketing roles within Xerox Canada. Karen was our “boss” during her time at CenterBeam. During one five-year period, CenterBeam credited PointClear with helping them grow 45% per year compound annual growth. Karen, welcome to the broadcast. Chief Outsiders, LLC is a nationwide “Executives-as-a-Service” firm, with more than 60 part-time, or fractional, Chief Marketing Officers (CMOs) engaged from coast-to-coast. Unlike other strategic marketing and management consulting firms, each CMO has held the position of VP Marketing or higher at one or more operating companies. Chief Outsiders have served on the executive team of over 600 client companies to drive growth strategy and execution plans for a fraction of the cost of a full-time executive. Because of its market-based growth plans, quality of leadership, and experienced team, Chief Outsiders has been recognized for the past four years by Inc. Magazine as one of the 5,000 fastest growing privately held companies in the US, and was recognized in the Houston Business Journal’s Fast 100.